Coach Rich Foulk. They were the “Little Track Team that Could”… and did! They finished the season 7-1, 5-1 in the Erie Shore Conference. With only 13 girls active in the OHSAA District Meet, they were considered the “Dark Horse” by many in the track community. Thirteen girls is the number of athletes one would associate with a Division 3 or 4 school, but certainly not in the Big School category of Division 1 within which they had to compete. To say the least, it is very rare for a group so small to be able to garner a Division 1 District Title by upsetting the likes of Elyria, Admiral King, and Amherst. They became the only Lorain High Steelman Girls Track Team to win the district up until 1988. The 1988 District had to be perfect: no false starts, no dropped batons, no improper lane exchanges, no missed handoffs and no tripping over a hurdle. That is exactly what happened… an awesome performance! Five girls in 8 events were sent to the Regional Meet. Throughout the season eight Lady Steelmen records were established in the 100m, 200m, and 400m dashes; the 800m, 1600m, and 3200m runs; the 300m low hurdles; and the 1600m relay. Finally, they produced a State Champion. 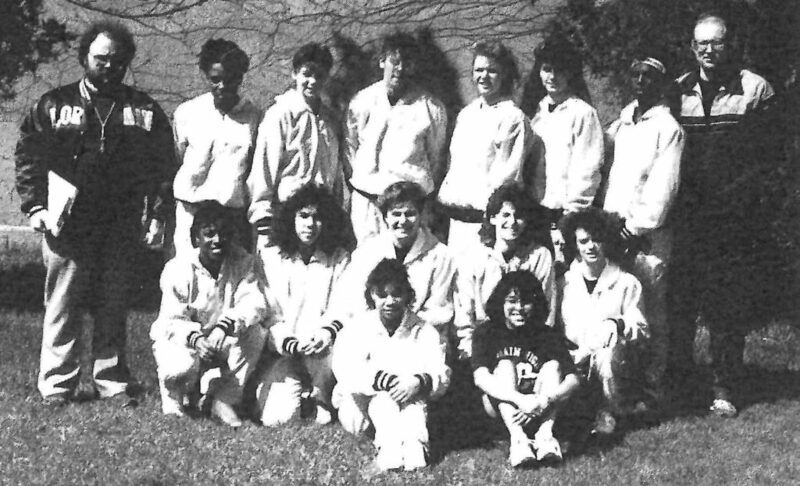 Lillian Saez finished first at the State Meet in Columbus, becoming All Ohio D-1 for the second time and going undefeated in the 400m dash throughout the 1988 Season.